There are some things I don’t blog about because they are too small. Others go unmentioned because they are too large. What I am writing about now is something that started out as an uncomfortable feeling that I was missing out on something, then grew to become an interest and a motivation, and has finally come to be the framework in which I think. Only hints and reflections have made it into my writing so far, whether on this blog or in the pages of Sky & Telescope. The first time I explained it to anyone else was with my friend and fellow observer Steve Sittig about a month ago, and the second time was in the talk I gave at the Three Rivers Foundation star party last month. This is my first attempt to put it into written words – we’ll see how it goes. I’m illustrating this post with slides from my 3RF talk. This is where we all start out. By necessity – there is nothing else to talk about if we can’t locate things in the sky. 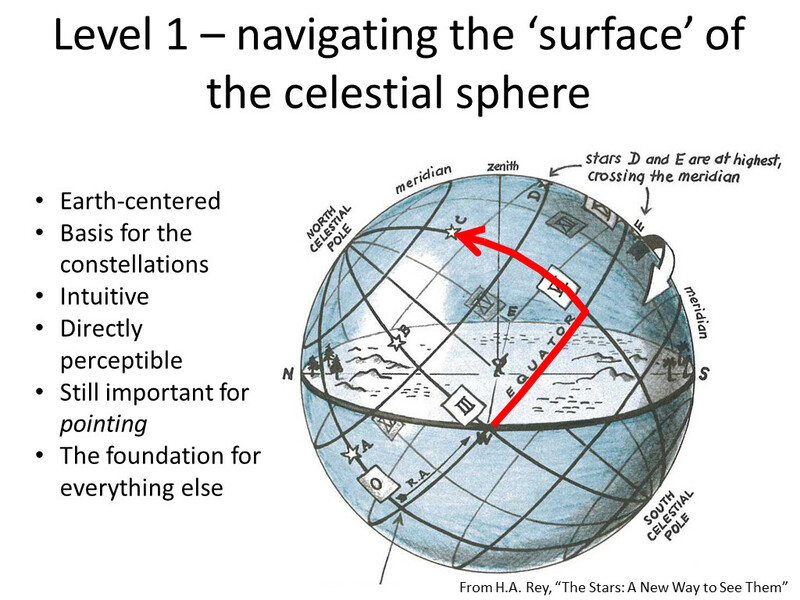 But crucially, at this stage to “locate things in the sky” means to figure out how to point at them in the sky as seen from our position on Earth. If we’re talking about a specific object, like M11, the Wild Duck Cluster, then it’s just an address on the surface of an imaginary sphere: RA 18 51, Dec -06 16. That’s important – it’s the basis for an entire science, that of spherical astronomy – but it’s only a start to understanding the structure of the universe and where we are in it. This stage is what I’ve referred to as “shattering the bowl of the sky” – learning the distances to celestial objects so that we can see space as space, not just a dome with lights over our heads. 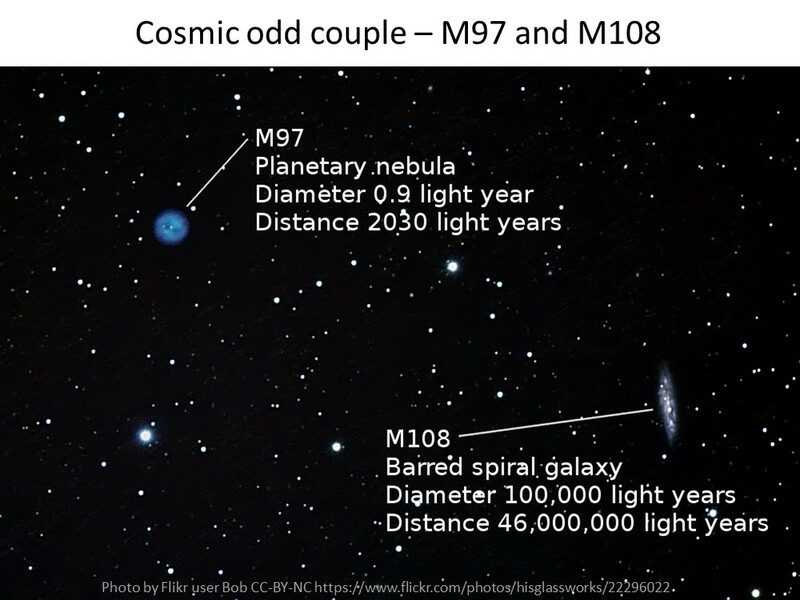 An important clue that this is something I should be thinking about came when I first observed M97 and M108. Here are two objects of roughly equal brightness, easily framed in the same field of view in binoculars and telescopes, that are in fact at vastly different scales and distances. We think of M97 as being “out there”, but it’s practically right next door to us in our own galaxy. If the Milky Way is 100,000 light years across – and it is at least that big – then M97 is only 2% of the way across the galaxy from us. It’s right next door. From the perspective of any observers in M108, looking across the intervening 46 million light years, the distance between our solar system and M97 would be unresolvably small. 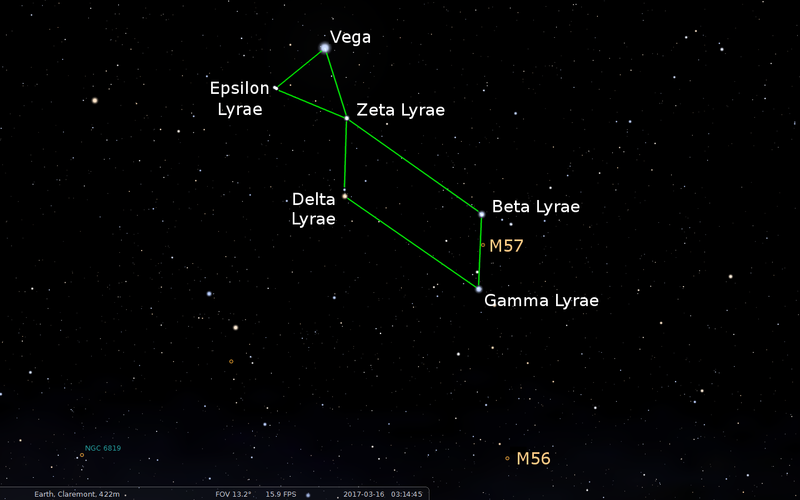 Here’s an extended example: the major stars and Messier objects of the constellation Lyra. 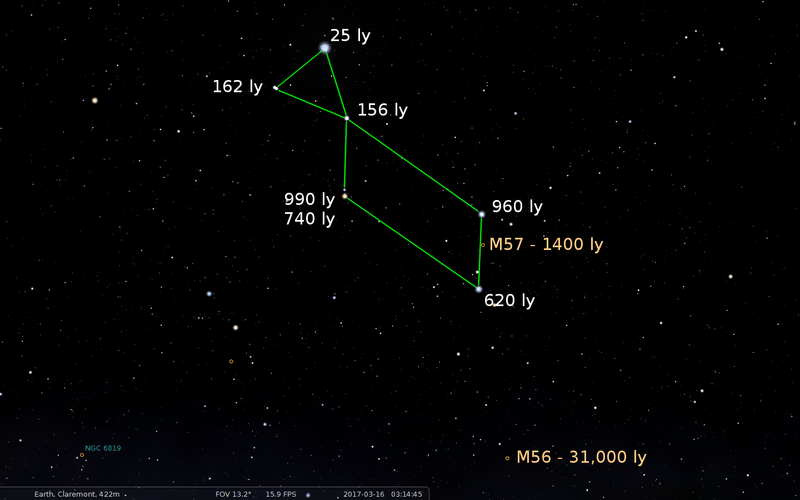 If you’ve been observing for long, you probably know your way around the triangle and parallelogram asterisms, and how to use them to find M57 and M56. It’s natural for us to think of these things as belonging together, because we use them as signposts to guide us when we navigate this part of the sky. Adding the distances reveals some things. At only 25 light years distant, Vega is in fact closer to us than it is to any of the other stars or DSOs in the field. The other two stars in the triangle are about equally far away, roughly 160 light years, and the other three stars in the parallelogram are ranged between 600 and 1000 light years distant. M57 is a bit further, but M56 is way further out, almost a third of way across the galaxy. Even from M56, our own Sun and all the stars of Lyra would blend into the faint background of field stars that saturate the Orion Spur. 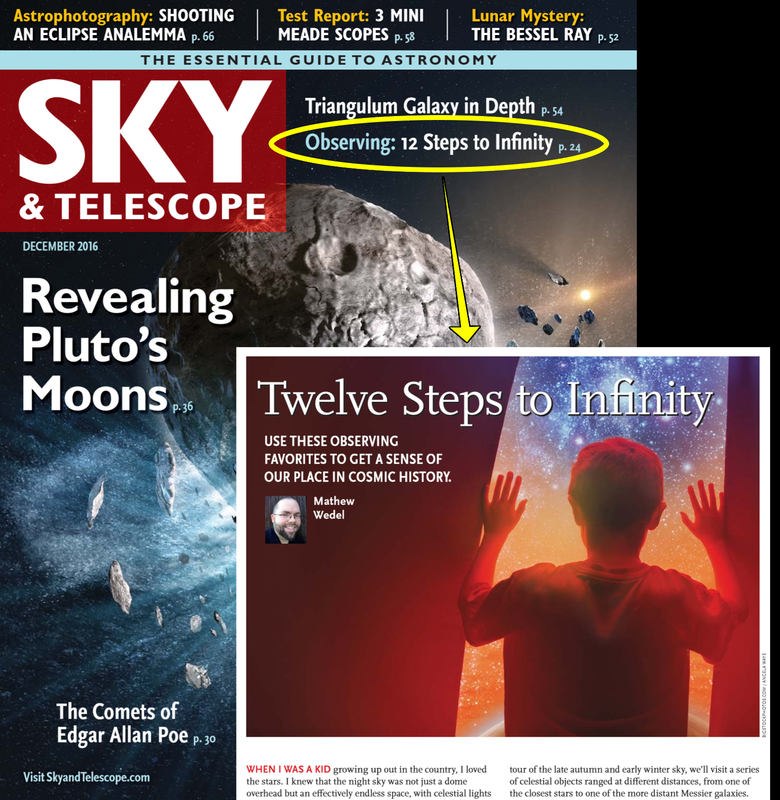 I was really proud of myself for starting to think about my observing targets on this level, and this view of the sky formed the basis for my article “Twelve Steps to Infinity” in the December 2016 S&T. But it’s not enough. I’ve come to think of this as “army ant observing”. 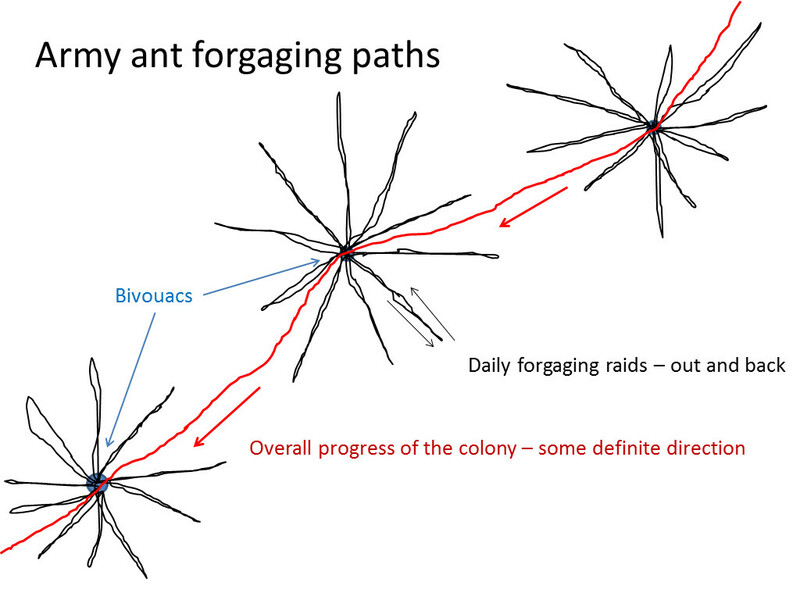 When they are foraging, army ants go out from their bivouacs in straight lines, eating everything they can catch along the way, and come back the same way, just like an observer looking at Lyra. If all we learn about objects in the night sky is how to find them and how far away they are, then we’re still trapped in an Earth-centric view of the universe. We don’t know how the objects relate to each other, any more than a colony of army ants knows that the lizard they devoured on Tuesday hatched out of the same clutch as they one they caught on Friday. To return to the example of M11, it’s 6200 light years away. That’s pretty darned far for a bright open cluster – the average for Messier and Caldwell open clusters is 3000 light years. We might suspect that to be so bright and so rich at that great distance, the cluster must have many, many stars, and indeed it does, a whopping 2900 of them. 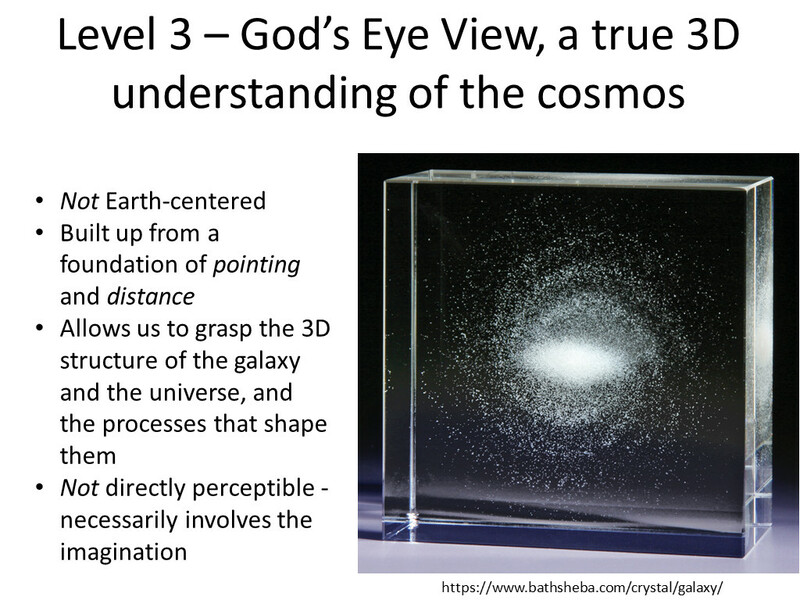 There’s at least one more level of understanding: to hold something of the true 3D structure of cosmos in our minds, and understand how celestial objects relate to each other, without reference to Earth. I illustrated this with a map of our galaxy laser-etched into a cube of crystal. To hold the structure of space in my mind and be able to turn it over and around, view it from all sides, like someone turning that crystal over in their hands – that’s what I aspire to. I’ll never get there, really. It’s an impossible project. There’s just too much stuff out there. But that’s okay. As a paleontologist, I’m familiar with the problem of envisioning other worlds based on incomplete information. And everything I do learn, every step up the long road to the stars, deepens the experience of observing for me. Back to M11. It’s a rich cluster, and it’s situated in the constellation Scutum (as seen from Earth…), not far from the center of the galaxy in Sagittarius. But in fact it has nothing to do with the central bulge of the Milky Way galaxy. The galactic center is 27,000 light years away from us, and M11 is only a little over 6000, a bit over one-fifth of the way. Instead of being part of the galactic center, M11 is one of the clusters that marks the Sagittarius arm of the Milky Way, which is the next arm inward, between us and the galactic center. M11 is still out in the burbs, with us, not downtown. In contrast, the globular clusters in Sagittarius, Scorpio, and Ophiuchus actually are related to the galactic center – they are swinging by it, like comets sweeping past the Sun, on incredibly long, elliptical orbits that carry them tens or hundreds of thousands of light years out into the galactic halo. So here’s my ambition. We have loads and loads of observing guides, like NightWatch and Turn Left at Orion , based on Level 1. Again, that’s not a bad thing, and it’s of necessity. We all have to stand and walk before we can run, and finding things in the night sky is the first step. But as a community, we have people on this already, not only in the vast majority of existing observing guides, but also in the observing features – including most of my own! – published in astronomy magazines, blogs, and online fora. 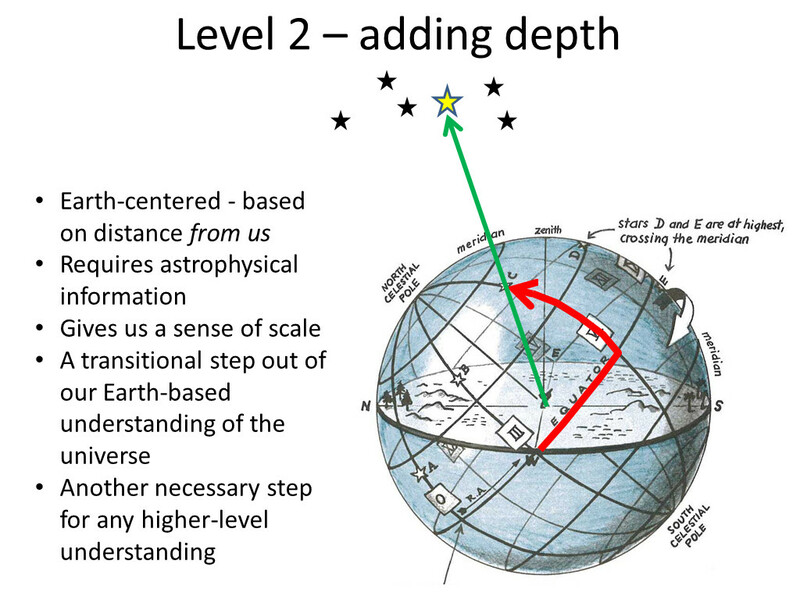 There are also resources that address Level 2. Stephen James O’Meara’s books live there – they address not just where to find things in the sky, and what they look like, but also what they are, how far away they are (and how their appearance relates to their distance from us), and even, in some cases, how they relate to other nearby objects. Things get better – a bit – when we get beyond our own galaxy and observe others. The Astronomical League has an observing program for the Local Group and galactic neighborhood, for example. And lots of observing guides and articles on the Virgo Cluster include some basic astrophysical data, including the fact that M87 is a monster elliptical and the central galaxy of the cluster. A diagram I drew to help get my head around the shape of the galaxy and our place in it. Based on images and data from NASA. What we don’t have many of, and what those of us who aspire to Level 3 desperately need, are observing guides that address the relationships of celestial objects within the Milky Way. I want an observing guide to the clusters and nebulae of the Sagittarius arm, for example, something that will tell me that M11 is not just 6200 light years away, but that it’s related to M16 and M17 because all three objects are in the same spiral arm of the galaxy. 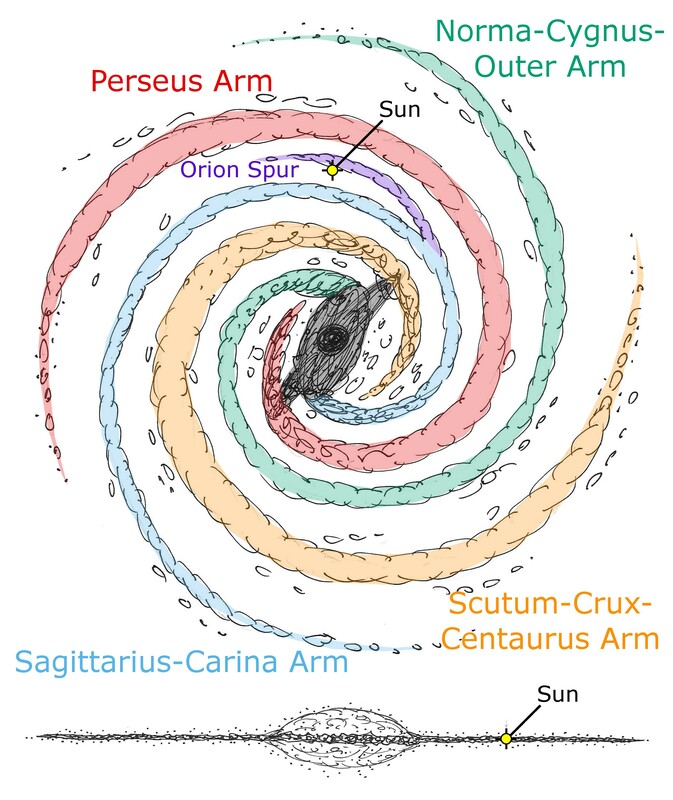 I want a guide to the Perseus arm, and another to the Orion Spur and Gould’s Belt. One of the reasons I’m so excited by Allan Dystrup’s “Classic Rich Field” thread on Cloudy Nights is that Allan has provided a wealth of information on easily-observable OB associations in the nearby reaches of the galaxy. There is one book that does address the internal structure of the Milky Way, albeit more from an astrophysical than observing perspective. It’s The Guide to the Galaxy , published in 1994 by Nigel Henbest and Heather Couper. A couple of decades on, I assume that at least some of the information in the book has been superseded by new discoveries. But it’s still an interesting and useful resource, and with used copies going for just over two bucks on Amazon, a low risk for anyone who wants to investigate (I have a copy already). UPDATE April 17: This is what I get for posting in the middle of the night. Several commenters reminded me of resources that do address Level 3 that I forgot to mention. Among them are Craig Crossen’s books Binocular Astronomy and Sky Vistas and Bill Tschumy’s resources at ThinkAstronomy.com, including his program “Where is M13?” and his essays “Milky Way Rising” and “Escape From Plato’s Cave“. The oversight was particularly dumb since I have Crossen’s Binocular Astronomy on the bookshelf next to me, I’ve corresponded with Bill Tschumy before and he’s been very generous with his thoughts, and in “Escape From Plato’s Cave” he lays out basically the same manifesto as I have in this post. Chalk this up to tiredness – I certainly meant no slight to the other observers and authors who have trod this path before me. It may seem like I’m being dismissive of observing guides – or observers! – that prefer to work at Level 1 or Level 2. That’s not my intention. As far as observing goes, I like Uncle Rod’s dictum that there’s no wrong way to do amateur astronomy. As long as you’re out soaking up photons, or letting your equipment soak them up for you, good on ya. May a thousand gardens grow. I started as a purely recreational observer, and stargazing for no more noble purpose than personal aesthetic enjoyment still occupies a lot of time out under the stars. It also, eventually, fired the curiosity and the hunger for a more informed and encompassing view of the universe. I see these approaches as complementary rather than conflicting. I would never have desired to learn the secrets of celestial objects – their relationships, the processes that shape them, their origins and fates – if I hadn’t fallen in love with them in the first place. As far as observing guides go, here’s my thinking. The God’s Eye View of the cosmos is an edifice of the imagination. Each of us that wants to understand the structure of the cosmos on this level will have to build our own mental model to play with and learn from. And we need raw material. Those observing guides, books, and articles that never get beyond Level 1 or Level 2 are still good and useful things: they’re bricks and boards that we can build with. We may have to dig into online databases and astrophysical literature to find the connections we’ll need to join them, but we’ll get farther if we don’t have to invent everything from scratch. Everything is potential grist for the mill. I have recommended the monthly Evening Sky Map to countless people as a way for them to learn the sky. I wonder how much progress I could make if I learned the distances to all of the targets on each month’s lists, and looked for connections among them? You are currently browsing the 10 Minute Astronomy blog archives for the day Thursday, April 13th, 2017.